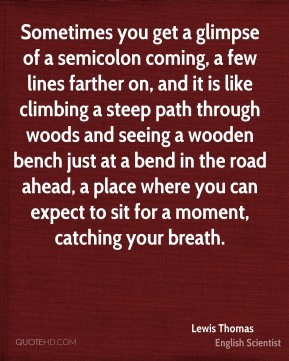 Sometimes you get a glimpse of a semicolon coming, a few lines farther on, and it is like climbing a steep path through woods and seeing a wooden bench just at a bend in the road ahead, a place where you can expect to sit for a moment, catching your breath. 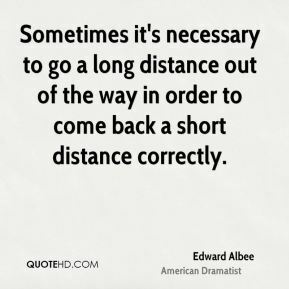 Sometimes people think (that) to see that we are family is to be sentimental. 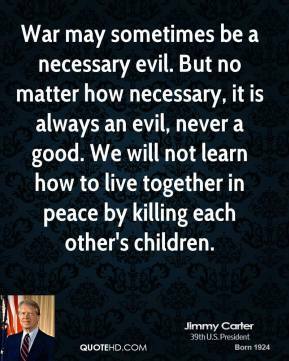 But one has to say: This is one of the most radical things, actually. 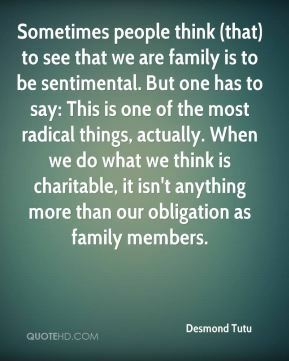 When we do what we think is charitable, it isn't anything more than our obligation as family members. 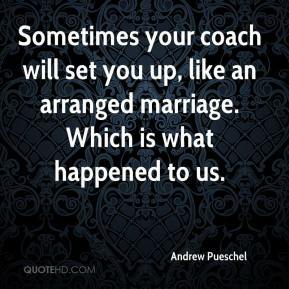 Sometimes your coach will set you up, like an arranged marriage. 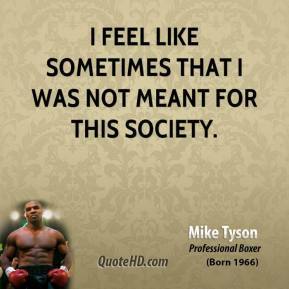 Which is what happened to us. I have probably given him too many minutes. Sometimes fatigue sets in, and the first thing it affects is your shot. 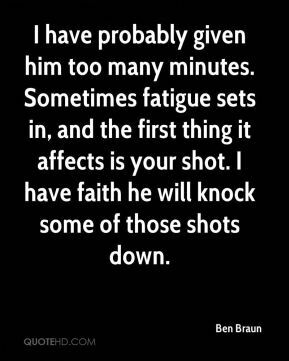 I have faith he will knock some of those shots down. 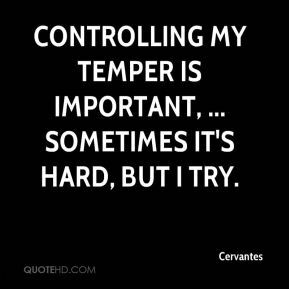 Controlling my temper is important, ... 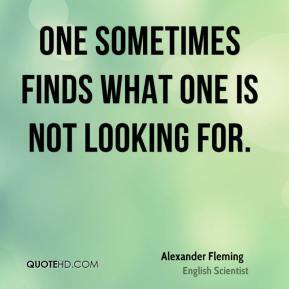 Sometimes it's hard, but I try. 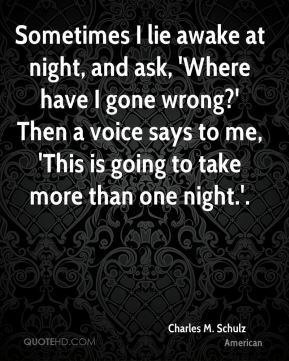 Sometimes I lie awake at night, and ask, 'Where have I gone wrong?' Then a voice says to me, 'This is going to take more than one night.'. 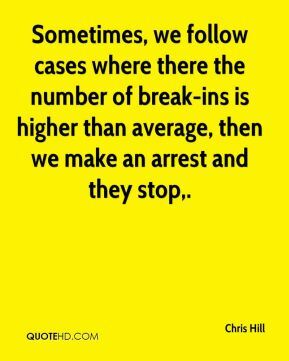 Sometimes, we follow cases where there the number of break-ins is higher than average, then we make an arrest and they stop. 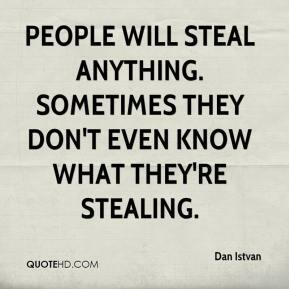 People will steal anything. Sometimes they don't even know what they're stealing. 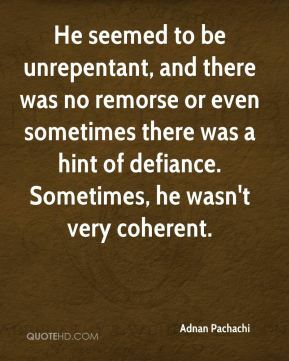 He seemed to be unrepentant, and there was no remorse or even sometimes there was a hint of defiance. Sometimes, he wasn't very coherent. 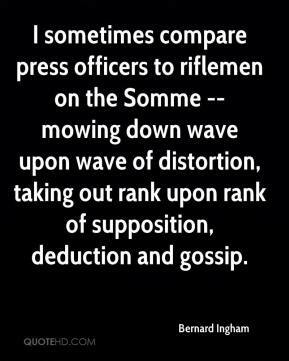 I sometimes compare press officers to riflemen on the Somme -- mowing down wave upon wave of distortion, taking out rank upon rank of supposition, deduction and gossip. 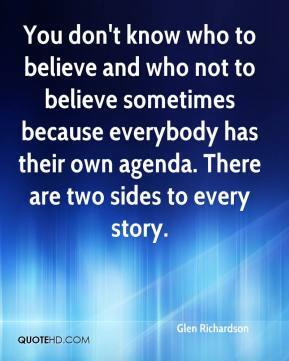 You don't know who to believe and who not to believe sometimes because everybody has their own agenda. There are two sides to every story. 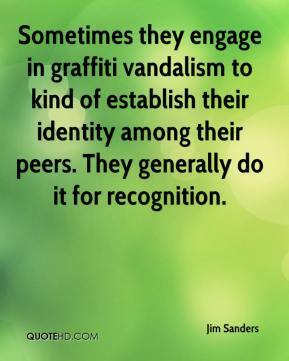 Sometimes they engage in graffiti vandalism to kind of establish their identity among their peers. 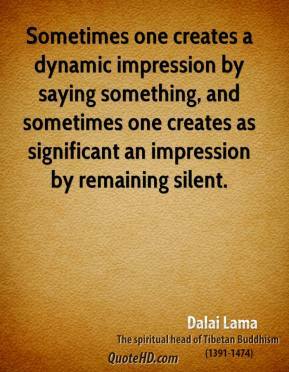 They generally do it for recognition. Sometimes, because of its immediacy, television produces a kind of electronic parable. 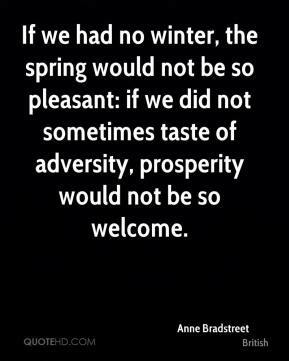 Berlin, for instance, on the day the Wall was opened. 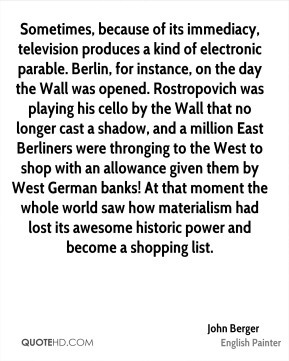 Rostropovich was playing his cello by the Wall that no longer cast a shadow, and a million East Berliners were thronging to the West to shop with an allowance given them by West German banks! At that moment the whole world saw how materialism had lost its awesome historic power and become a shopping list. We understand there are conflicts that sometimes leave people feeling hurt by others in the church, or other situations which have left people feeling isolated. 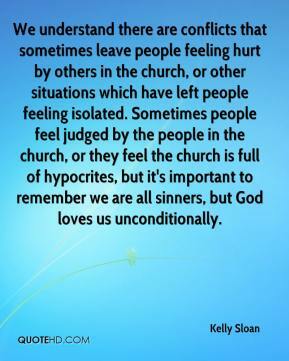 Sometimes people feel judged by the people in the church, or they feel the church is full of hypocrites, but it's important to remember we are all sinners, but God loves us unconditionally. 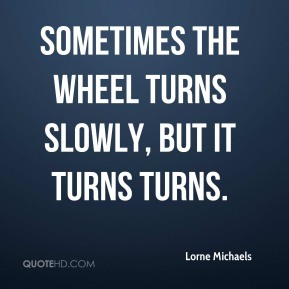 Sometimes the wheel turns slowly, but it turns turns. Sometimes, when you have a really hands-on director like a Michael Bay-type, who shouts a lot it's just so not good for your confidence and what's great about the way he (Allen) works is you don't block your instincts. You have total faith in him. 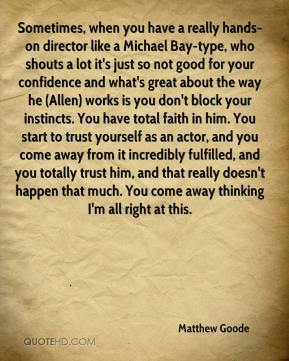 You start to trust yourself as an actor, and you come away from it incredibly fulfilled, and you totally trust him, and that really doesn't happen that much. You come away thinking I'm all right at this. 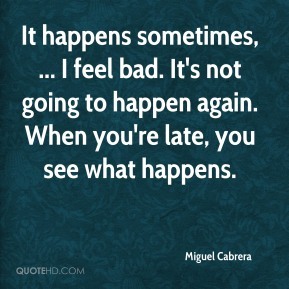 It happens sometimes, ... I feel bad. It's not going to happen again. When you're late, you see what happens. 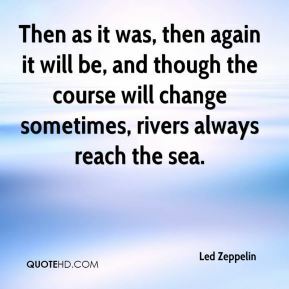 Then as it was, then again it will be, and though the course will change sometimes, rivers always reach the sea.